London: Ruben Loftus-Cheek became the first England player in 47 years to score a hat-trick in European competition for Chelsea on Thursday. The 22-year-old midfielder, who featured when his country reached the semi-finals of the World Cup in Russia in July, forgot about his frustrations at being unable to win a regular starting place at Chelsea by bagging all three goals as the London club swept to a 3-1 victory over BATE Borisov in the Europa League. Elsewhere, AC Milan suffered a shock 2-1 defeat against Real Betis at the San Siro, while Arsenal was unstoppable again as it remained perfect in the competition. Zurich, Salzburg, Eintracht Frankfurt and Dinamo Zagreb also picked up their third victories in as many group-stage games to move a step closer to reaching the knockout stage. Sevilla rebounded from a surprise 2-1 defeat at Krasnodar in the last round of matches with a 6-0 rout of Akhisar. Here's a look at the action. Loftus-Cheek pounced on a low cross from Davide Zappacosta in the second minute to put Chelsea, unbeaten in 13 games in all competitions, on course for a third straight Europa League victory. The young midfielder poked in his second goal from close range after eight minutes before curling in a 20-metre (yard) shot in the second half as Loftus-Cheek became the first England player to claim a European hat trick for Chelsea since Peter Osgood, the 'King of Stamford Bridge', in 1971. 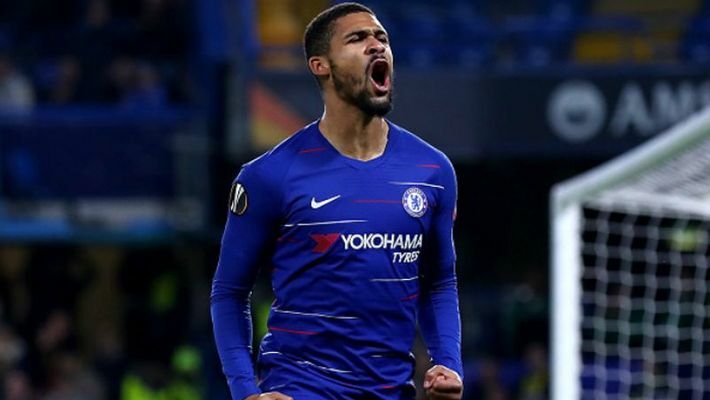 However, coach Maurizio Sarri said he was unsure if Loftus-Cheek would remain in the team for Sunday's Premier League game at Burnley. "We have a tactical problem with the midfielders," Sarri said. "We have four midfielders and three of them have the same characteristics." Aleksei Rios scored a consolation goal for BATE with 10 minutes to go. Chelsea has a maximum of nine points in Group L, six ahead of all three rivals in the section. Led up front by Gonzalo Higuain, seven-time European champions AC Milan looked hungry in the opening stages. But Betis was also dangerous in attack and Toni Sanabria's close-range effort put the Spanish team 1-0 up after half an hour. Higuain wasted a good chance in a one-on-one with Pau Lopez late in the first half. The Argentina forward argued that he was brought down as he rounded the Betis goalkeeper, but the referee was unimpressed and showed him a yellow card. Giovani Lo Celso fired a left-foot shot from long range in the 55th minute to make it 2-0 before substitute Patrick Cutrone pulled one back for Milan seven minutes from time. Milan's Samuel Castillejo, who hit the post earlier, was sent off for a rough tackle in injury time. Betis top Group F with seven points, one ahead of Milan. Olympiacos follows on four after a 2-0 victory at Dudelange. Coach Unai Emery made six changes to his starting line-up against Sporting but the story remained the same as Arsenal triumphed 1-0 to extend their winning streak in all competitions to 11. Pierre-Emerick Aubameyang and Danny Welbeck led the attack and it was the England international who scored the only goal 13 minutes from time as the London club won away against a Portuguese opponent for the first time, at the seventh attempt. Arsenal have nine points in Group E, three ahead of Sporting. Vorskla Poltava won 1-0 at Qarabag to move up to third with three points. In a tightly-contested Group J, Standard Liege came from behind to beat Krasnodar 2-1 and is tied on top with Sevilla and Krasnodar on six points. Roque Mesa put Sevilla, the most successful team in Europa League history, ahead with a superb shot after seven minutes before Pablo Sarabia made it 2-0 from the penalty spot. An own goal by Milan Lukac and efforts from Luis Muriel, Quincy Promes and Gabriel Mercado completed the rout against Akhisar. Salzburg control Group B on nine points after a 3-0 victory at home to Rosenborg. Munas Dabbur scored twice, once from the penalty spot, and Hannes Wolf also netted. Leipzig are second on six points after a 2-0 win over Celtic (3). Rosenborg has zero points. Filip Kostic and Sebastien Haller led Eintracht to a 2-0 win over Apollon and top spot in Group H on nine points. Last year's finalist Marseille lost 3-1 to Lazio and is now tied at the bottom with Apollon on one point. Lazio has six points. Villarreal crushed Rapid Vienna 5-0 to go joint top of Group G on five points along with Rangers, which was held 0-0 by Spartak Moscow. Zagreb came from a goal down to beat Slovak side Spartak Trnava 2-1 in Group D, while Zurich downed Bayer Leverkusen 3-2 in Group A.